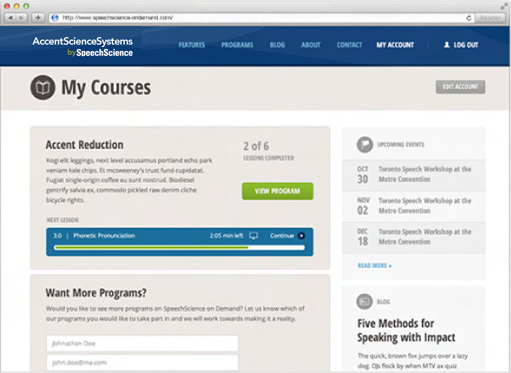 AccentScienceSystems is an interactive, results-driven online learning centre which provides the full advantage of the most comprehensive accent reduction program available. We ensure that participants achieve results while travelling, working remotely, or just very busy. Our unique, interactive method combines audio, video, text and one-on-one feedback wherever and whenever you need it, to ensure that you have success. 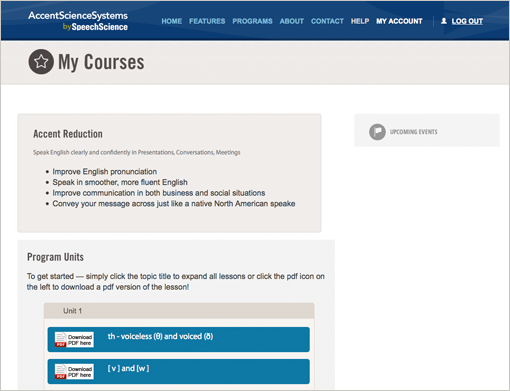 Live Coaching by Appointment – in person, Skype or by phone with an accredited SpeechScience Instructor. At the end of each chapter is a TEST. Record yourself – and compare your pronunciation to Bonnie. You can also send us your sample and we will analyze it and send you feedback. Sample test - "There are three things you can do with and without this theory."